There's no doubt Coca-Cola is to advertising what Nigerians are to the internet - they can sell you anything. But the company didn't fare too well in Australia with their carbonated energy drink Mother first time round - supposedly it was quite terrible, even by the metallic tangy standard of energy drinks. Rather than shying red-facedly away from a marketing and commercial disaster, the slick geniuses at Coke decided to "own" the controversy. When they reformulated the drink, they brought it back as Mother, rather than give it a whole new jazzy, zazzy name (I still remember the heartbreak of the Mello Yello/Lift saga, Coke, you bastards). But obviously they're worried their tongue-in-cheek campaign, that proudly boasts the new Mother is "nothing like the old one! ", won't be enough. So they've decided to get you hooked on sheer volume for cost value. I picked this can up at Coles for just $2.70. Most energy drinks will set you back around $3.50 for a can half the size. The Mother can is 500ml. It looks like a can of European beer. But instead, it's half a litre of taurine and caffeine. 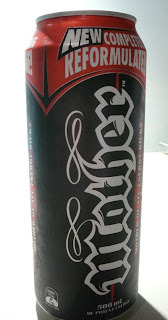 The message here is "If God drank energy drinks, he'd drink this one, 'cause he's HARD. F***ING. CORE." Who needs this much energy? Certainly not a work colleague of mine, Disco Stu, with whom I had to have a quiet word last week after noticing his repeated trips to our work vending machine, where the giant cans still cost only $3.00. I believe he's still yet to sleep after consuming two a day during shifts. THAT'S A LITRE, STU. A LITRE. It's fair enough, we do shift work, it's hard to keep the tiredness at bay sometimes. But STU, IT'S A LITRE. DUDE. As you can see from this photo, I have yet to crack open the tab on this one. It remains a tantalising top-shelf-of-the-fridge mystery. I'm somewhat hesistant to try it, as I think I'd rather like to get some sleep before Christmas. NO, STU, YOU CAN'T HAVE IT. Do you enjoy energy drinks? Did you try Mother back when it was bad? Would you try the new one just to see if it is, in fact, any better at all? Or will you do what I will and just stick to Pepsi Max? Does it have preposterous amounts of testosterone in it? DAMMIT NAT, DON'T GET BETWEEN ME AND MY MOTHER!!!!! Hmm, that came out a bit more disturbing than I imagined. I simply don't like the taste of them. They all taste kind of like licking batteries soaked in vinegar. As a matter of interest do you soak yourself in the vinegar before or after you lick the battery? They've gone to all that trouble to retool the drink but they didn't think to rebrand it just a little to do away with the rather Fascist feel of that particular font choice. hey nat..re. palins kids names..u left out the doozy of a name..barrack!!! i can clearly see it took a lot of grey matter giving birth to that 1..
palin drones..non seclator..try tuning into 4bc for the true meaning of drones.. I actually didn't mind Mother. Mainly because I'd drunk so much Red Eye and Red Bull at High School, I couldn't bear the taste of them any longer!